In Tolkien’s ‘Ring’ trilogy there’s a scene in the first book, The Fellowship of the Ring, where Frodo, the hairy-toed hero challenged with destroying the Ring, is attacked by the Ring Wraiths, the Nazgul. Mixing our genres a moment, let’s just say that these former Kings have gone over to the Dark Side. The Ring is their Force; slaves to its power, it determines their destiny. Unsurprisingly, they’re pretty keen to get the ring back, and run old Frodo through attempting to do so. Frodo, being stabbed by a cursed blade, a Mordor blade, begins to transform. Mixing our film genres yet again, it’s rather like a Dementor, sucking not just the happiness out of him, but his will to live too. He’s becoming a shadow-human; living somewhere between the dark world of Mordor and the ‘real’ world of Middle Earth. His eyes glaze over as if he’s wearing those freaky Halloween contact lenses and he becomes all pallid and sweaty; but a couple of Paracetamol won’t sort him out, he needs Elvish medicine, and there’s no Co-op pharmacy anywhere to hand. Frodo should be a warning to us about the real impact of these brewing mega-mergers. As I wrote in my last post, there’s a lot of debate about the potential implications of ABI buying SAB. Will it be an opportunity for the small guys? Will the middle-rankers be able to pick up some tasty titbits that fall from the table? We will see in due course of course, as a period of intense restructuring will be catalyzed across the industry by the deal, should it go through. Despite the huge resources of these mega-brewers; people, time, money, the truth is all these businesses want to do is focus. Focus on simplifying hugely complex operations; focusing on managing families of brands; focusing on cutting back; focusing on maximising profit from doing scale activities. Fewer brew streams; fewer breweries; fewer priorities with fewer people throwing off more and more and more money. My concern is for the brands that don’t make the cut; neither one of the (very few) global focus brands; nor a big local leader. I have experienced first hand great brands – important brands – being virtually exterminated by mega-mergers. At the start of the noughties, the leading cask ale in the UK was Draught Bass, that lovely nutty pale ale that characterized great Burton brewing. But then Interbrew bought the brewing assets off Bass plc… and suddenly a treasured jewel becomes a bit-part portfolio player, its value not in the legacy and heritage it represents but the profitability it throws off in one market (the US). Immediately the brand tumbles; immediately daft marketing put in place by daft leadership fills a void that needn’t have existed in the first place. Where is Bass today? Probably on keg in a golf club selling a dozen pints a week, if you’re lucky. And I was reminded of it again the other week on a trip to The Netherlands. Heineken, the dominant Dutch brewer have a range of riches to call upon there: Heineken itself; Amstel, Brand (originally from the south of the country), Affligem… and a wheat beer, Wieckse Witte. There’s a wraith brand if I ever I’ve drunk one. In the all-consuming push for growth; these marketing companies forget the product truth; forget what made the beers great. They push for the centre-ground and while they may win an election or two, they lose the distinctiveness. 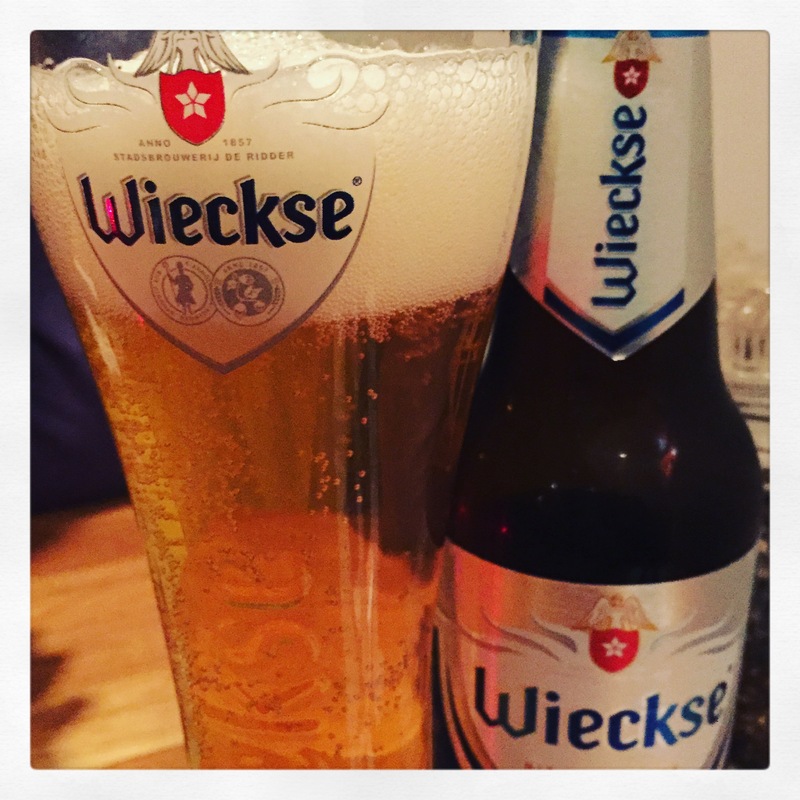 That’s Wieckse Witte for you: thin; bland; no bananary-ester character, no clovey yeastiness; no malt-accented body nor hoppy aroma. It’s a hazy pale lager poured from a bottle that’s had the character designed out of it. A brand that’s passed form the land of the living into a brand of virtual reality; of focus groups and social content; of believing that what people tell you on Twitter is actually true or that ‘Follows’ or ‘Likes’ amount to something. It’s a brand that’s barely concealed in its shallow grave; colour washed from its cheeks as it slowly turns into a zombie, all personality lost, just a tool, a puppet, for delivering profit. And that’s the thing with the centre-ground. You may win an election, but eventually you become unelectable. No one knows what you stand for. Everyone has forgotten what made you great. You’re just magnolia paint on unremarkable walls. And that perversely, is the real benefit of the mega-mergers. Tread warily around the ‘profit-opportunity’ sirens that call. There may be pickings to be had, but they won’t be easily won. But, these mega-companies, with their ever-blander mega-brands, are a constant beacon to remind independent brewers and characterful brands why they exist, and why it’s a future worth scrapping for. As the big get bigger, what do the small get? The potential acquisition of South African Breweries (SAB) by their larger rival Anheuser Busch Inbev (ABI) has got many commentators gasping for breath: not at the audacity of it – that was reserved for when InBev (as was) took down Anheuser Busch – but rather the implications of the sheer scale. The scale, both of the deal (the fourth biggest corporate takeover) and the ultimate beast it will become (who we shall call ABSAB). Interestingly, a stock response of commentators is ‘Don’t Panic Mr Mainwaring!’ The deal, as these deals do, will create opportunities for smaller operators. Drinkers, reviled by the deal and the inevitable consolidation / loss of brands in the shake-up, will vote with their wallets and support the little guy. New market niches will open up, too small for a goliath like ABSAB to spot, yet alone exploit. David will win the day! Fleet of footedness, quick decision-making will out! And there will be some of this. Of course there will. But on balance, it’s a romantic notion and one that, in truth, isn’t borne out by precedent. The first issue is growth. In most western, mature consumer markets beer is flat-lining or declining. Drinkers are drinking less. This pressure rolls through to licensees: what to stock; how much space they can give to beer and ultimately what brands end up on the bar. What licensees want is a range of guaranteed strong sellers and a ‘something interesting’ selection. ABSAB (Stella, Peroni, Budweiser) can fulfil one side, craft can fulfil the other (in fact, increasingly, ABSAB can fulfil this other side too). In less mature markets, there is underlying growth in beer consumption – in central and South America for example – and that growth is driven by brands. Big brands; famous brands, foreign brands; often American or European: brands that are a status symbol. ABI and SAB are getting together because growth in their core markets is slowing (or has stopped). They’re getting together because in emerging markets it’s about brands. The deal allows more consumers to access their brands in more markets, efficiently and cost effectively. And most consumers won’t react negatively. They won’t even think about it. The second issue is craft. Craft beer, however you define it, is exciting, interesting and inspiring. It’s been brilliant for beer in many markets. But craft beer is, what? At best 10 – 15% of market volume. Most of us, most consumers, simply aren’t in the franchise or drink it infrequently. Most of us, in short, drink the sorts of beers that ABI and SAB make. Now, clearly there is growth and clearly craft is slowly, steadily impacting consumer perceptions of the market. But if we assume that the basis of the ‘Innovation-Adoption Curve’ is correct, then most of us are fairly unadventurous. We’ll follow. And what will this mean in terms of brands? It won’t mean opportunities for spontaneous fermented wild beers hitting the mainstream. It will mean the likes of Blue Moon, Goose Island, Meantime, Lagunitas, Kona becoming more widely available, and if we’re lucky the larger – independent – craft brewers – Sierra Nevada, Brooklyn, Boston Beer will be available too. But the real opportunity if for the crafty beers under the umbrella of brewers like ABSAB. They offer the rationale of differentiated choice, with the convenience of a single and efficient point of supply. What ABSAB appreciate is that currently global brewing is over-supplied. There are two responses. One, consolidate to ensure supply over time reduces and is done cost effectively. Two, build brands. This deal does both and will be successful. For smaller brewers, given that they can’t consolidate to the same level, the real opportunity is the second option. To build brands. Take the UK beer market. There are now 1,700 breweries. The UK is the most breweried-per-head country in the world. Yet the beer market has been declining at about 4% a year since 2005. Per capita consumption of beer is falling, despite the noise of craft. There will be a fall out, even with the UK Government’s small brewer duty relief (perhaps because of it). Now is the time to build brands not supply product. Look at Camden Town, only three years old, but already widely available throughout the capital. Why? Good beers (with broad appeal); tremendous branding. Look at Beavertown. Good beers (with more challenge to them), impactful branding. No, the opportunities presented by ABSAB getting together are twofold. For consumers, it’s in the truly niche operators, who make more complex, highly differentiated and challenging beer styles that they can supply effectively to the market. For small brewers who don’t, the real opportunity is to build your brand. And the real money is to be made when the likes of ABSAB buy them from you. Author David PrestonPosted on November 6, 2015 Categories BrandsTags ABI, Beavertown, Blue Moon, Boston Beer, Camden Town, Goose Island, SAB, Sierra Nevada Pale Ale1 Comment on As the big get bigger, what do the small get?